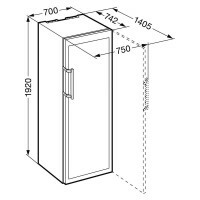 A Liebherr WTes 5972 Vinidor purchase means that you have the possibility of a total of 211 bottles of wine to store. The bottles must be the size of a bordeaux bottle. Since the two separated compartments WTes 5972 has, you have to keep in mind with 68 bottles in the top compartment and 146 bottles in the bottom compartment. The wine Cabinet is made of stainless steel and has a brilliant design what for Liebherr a Reddot award.